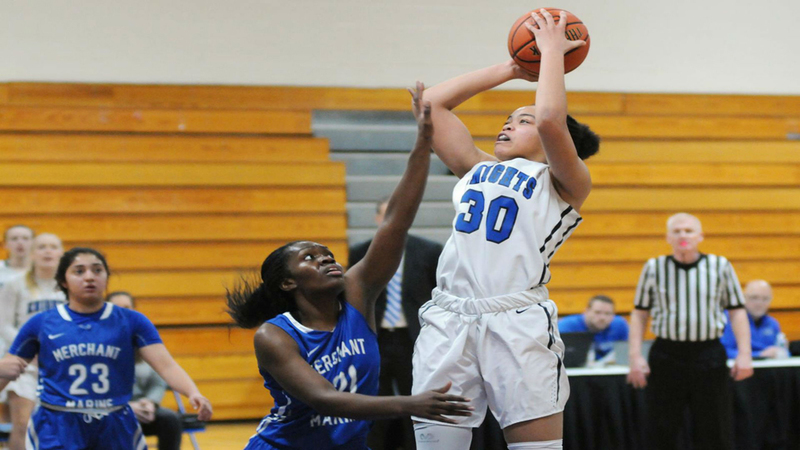 Mount Saint Mary’s Kayla Cleare’s scored 23 points as the Blue Knights defeated St. Joseph’s-Brooklyn, 74-64. NEWBURGH – The Mount Saint Mary College Women’s Basketball team extended its winning streak to three on the road against St. Joseph’s-Brooklyn, 74-64, behind Kayla Cleare’s 23 points. St. Joseph’s-Brooklyn got off to a hot start, knocking down three three-pointers, to give the Bears a 12-10 lead after the first quarter. Elizabeth Limonta had four of the 10 points in the quarter. The Knights responded with a strong second quarter, led by six points from Cleare and five from Lauren Desrats, to take 29-24 lead at the half. The third quarter was the turning point for the Mount, as it dominated the stanza by outscoring the Bears 27-13. Cleare had nine points and Limonta had seven to push the Knights’ lead to 19 heading into the final quarter. St. Joseph’s-Brooklyn responded with a strong quarter of their own, outscoring Mount Saint Mary 27-18, but the Knights held on to win the game by 10. Katie Smith had seven points to pace the Knights in the final stanza. Cleare finished 9-for-14 shooting and added seven rebounds, two assists, and two steals. Limonta finished the game with a double-double with 13 points and 11 boards and Desrats added 10 points, four rebounds and two assists. Smith chipped in seven points, seven assists and two rebounds while Annie Keenan added seven points, five rebounds and three steals. Kelly O’Donnell scored 24 points for the Bears, adding three rebounds, while Victoria Porcasi finished the game with 13 points, eight rebounds and two assists. Caitlyn Staab chipped in 11 points, six rebounds, three steals and two blocks. The Mount finished the game outshooting the Bears 44.6-percent to 32.8-percent and outrebounded St. Joseph’s-Brooklyn 45-34. The Knights dominated in the paint, outscoring the Bears 36-8 in the lane. Mount Saint Mary converted 14 Bear turnovers into 17 points.